Confessions of an Semi-Overweight, Middle Aged, Runner and Triathlete. Last year, after having to drive to Long Beach on Friday for packet pick up and again on Sunday for the race, I came up with the idea for a Race Packet Pick Up Service. I posted a survey and asked my running followers on twitter to take the survey, here are the results....some of them may surprise you. nominal fee. We set up a survey (5 questions) and then asked for people to take the survey via twitter. We targeted runners and triathletes in this survey. We received 99 responses (limit on Survey Monkey) to the survey and 31 comments. Races already cost enough. Plus merchandise. Don't want to pay more just to get my race packet. Packet pickup is a social event in my town. If all races allowed packet pickup on race day - This would eliminate the need for a packet delivery service. There needs to be a happy medium between the races and the racers in terms of packet pick up. With the cost of gas, traffic, time off from work, I would rather pick up my packet on race morning. I would be interested in this service. Number four, I wouldn't pay for this unless under extreme circumstances. It would have to be a very special race for me to go to a race with a separate day pick-up packet deal. There isn't one in the US that I would do that for, but I know I'm not mainstream. I'd rather run up and down a mountain with my buddies than run an organized race most of the time. Yes we are hard workers, family members and we don't have the time to pick it up. This service will be great. I automatically (at least, so far) start looking for another race whenever I come to the part about "packet pickup will not be available on race day morning" - to me, that's just local influence trying to force people to spend $ on hotels, meals, blah, blah. to improve the local economy. I have gone out of town overnite just for a goal race, but not often. The only time I would consider using a service to save me a trip is for a large race (Cleveland or Akron marathon) that would save me from the hassles of parking and large crowds. I generally sign up for smaller races near my house. In the age of the internet, I should not have to go to the expo at all, nor should I have to pay for a service to to mitigate the luddite tendencies of race directors. If you're asking the question, then maybe it's a service that is needed. I personally have not run into the problem, but I tend to like small races that don't have these kinds of logistical problems. I would prefer that they mail the packet to me vs have it available for me to pick up on race morning. One of the races I run does this for $10. There is a need for races to send race packets through the mail or FEDEX to avoid personal pickup, but then, a potential business wouldn't benefit from this. If its big enough to have an expo prior to race day, I'll probably travel there prior to race day anyway. There is a need for races to allow for day-of pickup, not a need for further gouging of often exorbitant race prices. Packet pickup needs to be tightly integrated into the race day, and we should end all these separate pre-race pickups. Think of the carbon footprint of everyone who drives to a destination the day before simply to get their bib. There must be some means of getting the bib/chip to the runner that doesn't require yet another car trip. I think there is a need for this service that would help some out of town runners, or those that simply cannot make it to the race expo. I would still want to go to the expo whenever I can for the experience, but it would be nice to have this as an option if the situation requires it. I would pay maybe $2 - $5. Maybe not all within the "racing community" but within the casual runners community too. Target big races with frustrating expo rules (e.g. Dallas Marathon previously White Rock). I'm in! I probably wouldn't use it, but some folks might. I feel there is a need for races to be more flexible in letting others pick up packets for friends with just a written/emailed correspondence. One of my favorite parts about races - particularly larger races - is the expo. I like the experience of picking up my packet and checking out goodies from sponsors and vendors. I also like having everything the day before a race so I can be well prepared when I get to the start race day morning. That being said, I also understand how sometimes travel delays can prevent a runner from making it to the expo and then how are they supposed to get their race packet? Although inconvenient at times I like getting my own packet as part of the experience. That being said Im a student who also works full time so its not always easy. Race organizers should be more cognizant of hiw far people are willing to travel and the fact that they have lives outside their passion for running. The price would be a big factor. At $10, it would be a no-brainer. $15 or $20 could be justified if one has to pay for parking at the expo - a $10 parking fee would make a $15 pickup fee seem like a bargain. For my personal budget, I hate to add to the cost of races, but I avoid races that don't have race-day pickup, and it would be nice to now have an option for people like me. Some races now mail out packets in advance for a fee, so keep an eye on that as they are basically going to compete with this service. I instituted a "FastReg" VIP service at a race I promoted. I charged $35 to MAIL you your bag/t-shirt and provide front-row parking. Lots used it. More events need to think this way. I prefer having the packet mailed. I would pay $10 for that service. Races are already too expensive. Don't add another cost to it. Most races have day of packet pickup, anyways. I think its only on occasion that most people would need it but I like the idea of having a back-up, especially when socal traffic catches you off guard and you miss pick up by a few minutes. Shoot, I can check in online for flights! I think race day pick up should always be offered for the smaller events. Not sure I would really want to pay for it. I would just rather the organizers would allow it to be picked up by a friend. But if it saved me a hotel for the night, i would pay for it. Judging by the survey results and speaking with people in the running/triathlon community, there appears there is some interest in this service. It seems that the ideal price point is $10, but I think $15 could be acceptable. I was surprised at answer #2 and the amount of people that have not signed up for a race because they couldn't pick up their packet on race day I think the bigger picture is that races need to come up with a plan to either allow same day pick up or have an option to receive your packet via mail. I understand that having same day pick up for a large race is near impossible, but some of the small to mid size races, it could be feasible. Large races could do well with the mail option, which I know some races are now doing. responses from the larger races. I did get to sit down with the race director of a medium sized Marathon/Half marathon who gave me some great feedback and ideas as well as some concerns. 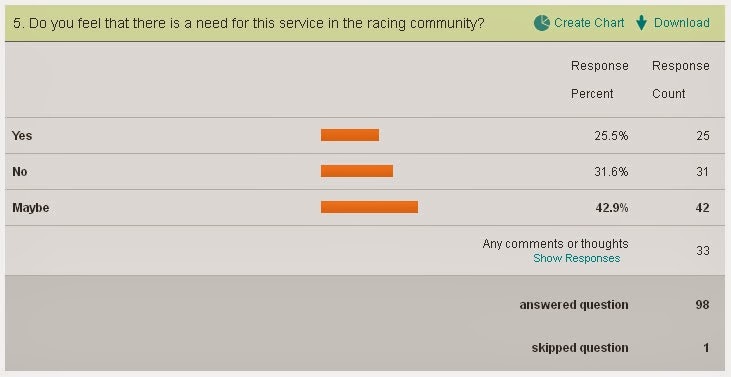 After the lack of interest from the races/race directors (they play an important role in this service), I put this idea on the back burner. 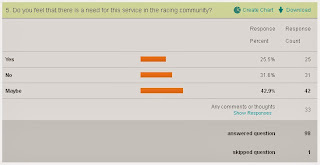 I have decided to publish the results for everyone to read in hopes that race directors will get a feel for people want in order to make a better race experience. I welcome your thoughts or comments…. Runner, Triathlete, Musician, Husband, Father and all around good guy! This is good bye and so long…. La Palma Run for Fun 5k with my new running buddy! Keeping Pace - Pacing life, one mile at a time.